As the instability in Libya increases, the local population fears more and more for its safety. Amongst this population, are our Libyan Delegates. Our Delegates, trained at the Generations For Peace Amman Camp 2013, came to us from the Libya Youth Centre (an organisation devoted to improving the socio-economic and psychological welfare of Libyan children). 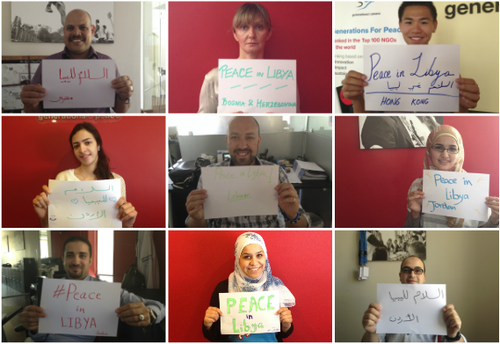 In the recent days, responding to the local situation, our volunteers at the Libya Youth Centre (LYC) have established a campaign entitled “Peace in Libya”. 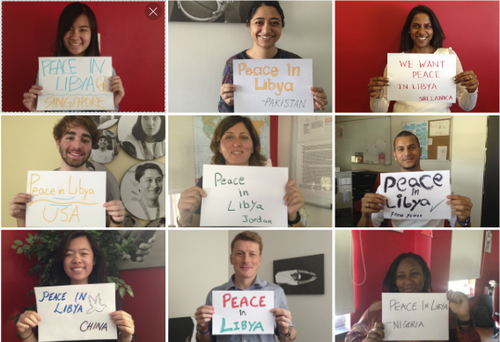 The campaign asks individuals to show their support for Libyans by writing “Peace in Libya”, alongside their country, on a piece of paper and posting it to the LYC Facebook page. This solidarity campaign is part of LYC’s larger strategy to keep Libyan youth off the streets during this unstable time. The premise is, that through the likes of Facebook counselling, online drawing and photo competitions, the Libyan youth will remain productively occupied and consequently safe from the unpredictable atmosphere outside their homes. We at Generations For Peace are proud of our Delegates for coming up with this creative and non-violent approach to peace. We encourage our Generations For Peace family to contribute to this campaign – pass it on…!